MOORESVILLE, N.C. (Jan. 2, 2013) – JR Motorsports announced today significant developments in its 2013 NASCAR Nationwide Series plans, as Great Clips Inc., the world’s largest hair salon brand, has signed a primary sponsorship agreement for 28 races next season. The partnership brings Kasey Kahne and Brad Sweet to JR Motorsports, adding to a lineup that already includes Regan Smith, the series’ most recent winner, and Dale Earnhardt Jr. This will mark the 13th year Great Clips has used the Nationwide Series to market its brand, making it the series’ longest-running sponsor. Kahne has a long-standing relationship with Great Clips dating back to 2003 when the company served as primary sponsor for the up-and-coming driver for three seasons. The company also recently announced a sponsorship of Kahne’s No. 5 Chevrolet at Hendrick Motorsports for three NASCAR Sprint Cup Series races in 2013. 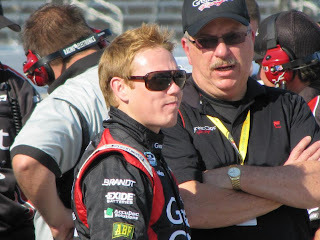 The addition of Great Clips further establishes the JR Motorsports line-up for 2013, albeit with substantial changes from two months ago. First, it guarantees the company will field at least two entries in 28 of 33 Nationwide Series events. Smith is already committed to driving a full schedule, and Earnhardt Jr. will compete in select races in a third car. Additionally, car numbers have been reassigned to align with Kahne’s branding in the Sprint Cup Series. Kahne and Sweet will split time in the No. 5 Chevrolet for 27 races. Smith will compete for a championship in the No. 7, and Earnhardt Jr. will carry his familiar No. 88 in a limited schedule that presently stands at four races. One of Earnhardt’s races will be with Great Clips branding to fill out the 28-race sponsorship package. JR Motorsports General Manager Kelley Earnhardt Miller said the organization still isn’t committing the No. 5 team to a full-season slate but continues to work at securing sponsorship to fill out the remaining six races. A teammate of Earnhardt’s at Hendrick Motorsports, Kahne is a 14-time Sprint Cup Series winner and seven-time Nationwide Series winner. He drove two races for JR Motorsports in 2011, finishing fourth at Kentucky Speedway and third at New Hampshire Motor Speedway. Kahne rejoined the Great Clips family in 2009 and, over the last three years, has competed in select Nationwide Series races with the company as his primary sponsor. Great Clips has since expanded its relationship with the Enumclaw, Wash. native over the years by being heavily involved in the driver’s charity events and serving as a primary sponsor for Kasey Kahne Racing. Part of that expansion has also included the addition of Sweet to the Great Clips driver lineup with the Grass Valley, Calif. native carrying Great Clips branding in 18 NASCAR Camping World Truck Series and 19 Nationwide Series races over the last three years. Like Kahne, Sweet is a product of United States Auto Club (USAC). He was hired by Kasey Kahne Racing in 2007 and has given KKR seven victories, including wins at the Belleville Midget Nationals, Knoxville Midget Nationals and Four Crown Nationals at Eldora Speedway. A race schedule for Kahne and Sweet in the No. 5 Great Clips Chevrolet is still to be determined. So, too, is Earnhardt Jr.’s complete Nationwide Series slate. To date his only announced races are Feb. 23 at Daytona International Speedway and March 9 at Las Vegas Motor Speedway, both in the No. 88 TaxSlayer.com Chevrolet. Great Clips Inc. was established in 1982 in Minneapolis. Today, Great Clips has more than 3,000 salons throughout the United States and Canada, making it the world’s largest salon brand. Great Clips salons employ nearly 30,000 stylists who receive ongoing training to learn advanced skills and the latest trends. Make Great Clips your choice for value-priced, high-quality haircare for men, women and children. No appointments needed, and salons are open nights and weekends. And, it’s more convenient than ever with Great Clips’ Online Check-In. To check-in online, visit www.greatclips.com or download the app for Android and iPhone. For more information about Great Clips Inc. or to find a location near you, visit www.greatclips.com. Based in Mooresville, N.C., JR Motorsports is the management company and racing operation for Dale Earnhardt Jr., NASCAR’s 10-time Most Popular Driver and winner of more than 40 NASCAR-sanctioned races. JR Motorsports competes in multiple racing divisions, including the NASCAR Nationwide Series, in which it has earned 10 victories since its inception in 2007. In 2012 the JRM late model program won the track title at Motor Mile Speedway with driver Josh Berry, giving the company its first-ever championship. To learn more about the organization, its drivers and its sponsorship opportunities, visit www.jrmracing.com.